Many times we investors make investing much harder than it needs to be. We spend countless hours researching trying to find the next Apple or Amazon. In reality, we could just deploy a simple dollar cost averaging strategy, save time and earn a nice return on our money. In this post, I am going to walk you through how to set up a dollar cost averaging strategy and show you how it works to make you money in the long run. Dollar cost averaging is taking a set amount of money on a regular basis and investing it into the market, regardless of how the market is performing. You can determine how frequently you want to invest – be it monthly, bi-monthly, whatever. The point is, you regularly invest money into the stock market. This strategy works by taking your emotion out of investing. Too many times we buy at the top of the market and sell at the bottom. This results in poor returns on our money. By investing on a regular basis regardless of what the market is doing, you are always buying. Yes you will be buying at the market tops, but you also will be buying at the bottom too. And when the market turns around, you are going to see a nice gain on those purchases. Let’s walk through a quick example of dollar cost averaging. You buy $100 worth of a mutual fund each month for a year. Below you see how many shares you buy each month along with the price of the mutual fund and your ending balance. As you can see, you ended up with $1,214 at the end of the year. This resulted in your earning $14 on your investment. Take note to the right hand column and see how you bought more shares when the share price was low and fewer shares when the price was high. This is exactly how you make money investing, buying low. Now, what if you had invested in all of your money at once? The big debate that rages on when people come into a windfall of money is whether they should invest the money all at once or use a dollar cost averaging strategy. There are advantages and disadvantages to each. For example, if you invest as a lump sum, all of your money is working for you, compounding right away. But if you invest all of your money at a market peak, you are going to have to wait a long time to start earning a return. If on the other hand you use a dollar cost averaging strategy, you run the risk of spending the money instead of investing it since it will be sitting in your bank account waiting to be invested. Of course, by using this strategy to invest, you lower your risk of investing your money at the wrong time. 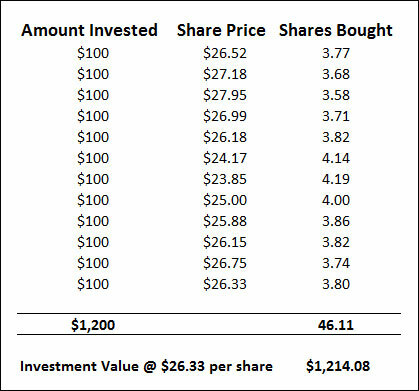 Using our example from above, if you invested all of your $1,200 during the first month, buying in at $26.52 share price, you would end the year with $1,191 which is a loss of roughly $9. But if you instead invested your lump sum during the middle of the year when the share price was $23.85, you would end the year with $1,324 which is a gain of $124. As you can see, when lump sum investing, it all comes down to investing your money at the right time. Of course, this example is just a hypothetical period of one year and you should be investing for a much longer time frame which will impact your results. The good news is that with dollar cost averaging, it is simple to get started. Investing in any mutual fund will allow you to use this investing strategy. Likewise, going with a robo-advisor like Betterment will also allow you to start dollar cost averaging. Some traditional brokers will allow you to set up this plan as well, usually with mutual funds or exchange traded funds. However, when it comes to stocks, there aren’t many options out there that allow for this strategy. Dollar cost averaging is one of many great strategies to use as an investor. It is particularly beneficial to new investors or those without a large amount of money to invest as they can invest smaller amounts of money on a regular basis. However, dollar cost averaging is not fool-proof. It won’t work 100% of the time earning you a better return than if you followed a lump sum investing strategy. Nor will it guarantee you come out ahead either. But with that said, it is a solid investing strategy. And the more consistent you are using it, the greater the likelihood of you coming out ahead of the market. Great explanation! Find a good mutual/index fund and take the emotion out of it by buying roughly the same amount on a fixed time interval. In the long run it’ll iron out those dips and leave you with steady growth!